Franz Schubert: Ellens Gesang III, D 839/Op. 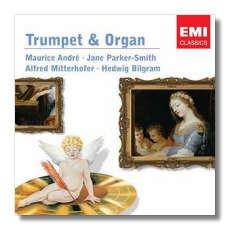 52 #6 "Ave Maria"
George Frideric Handel: Serse, HWV 40 – Ombra mai fù "Largo"
Jeremiah Clarke: Suite in D Major – Prince of Denmark's March "Trumpet Voluntary"
Herz und Mund und Tat und Leben, BWV 147 – Jesu bleibet meine Freude "Jesu, joy of man's desiring"
Of the organ by itself I am not always a fan, but if you combine the organ with another instrument, that's an almost sure recipe for happiness. Many instruments make fine companions for the "king of instruments," but few are quite as apt (or as popular) as the trumpet, thanks to its clear and penetrating tones. A CD of music for trumpet and organ is always enjoyable, not just on Sunday mornings, but also on late Wednesday nights. Of the 20 short works on this CD, none were written for this combination of instruments. (Perhaps I am wrong about Stanley's Trumpet Tune or Clarke's Trumpet Voluntary, but if I am, they are the exception that proves the rule.) The arrangers are named nowhere on this CD. (Remo Giazotto is credited with the arrangement of Albinoni's Adagio, but "arr. Giazotto" refers to his original arrangement of Albinoni's supposed "fragment," not to the arrangement for trumpet and organ heard here). Interestingly, Gloria in excelsis Deo (a.k.a. "Angels We Have Heard On High") is identified as the work of Handel. I always thought it was the work of "Trad." Perhaps EMI's annotator knows something that I don't. This is a selection from several recordings made between 1976 and 1981. Well more than half the program is taken from analog originals, but I don't think most people would be able to tell the ADD and DDD selections apart. Maurice André is the common element, of course, and his playing on all 20 tracks is as polished and charming as one expects from him. That hint of Gallic restraint so characteristic of his playing is evident here too. When he hits a stratospheric high note, the tone is as sweet as ever. His partners are less consistent. Of the three, Jane Parker-Smith is the best. (She plays on 14 of the 20 selections.) Alfred Mittenhofer, who plays on two of the tracks, is eloquent, but the organ of the Uzès Cathedral in France, has a very noisy mechanism. (Bach's Jesu bleibet meine Freude sounds like a trio for trumpet, organ, and the Good Humor truck.) Hedwig Billgram plays on the last four tracks. Her legato playing suits the two chorales by Krebs, but her reading of Bach's Wachet auf is much too smooth. The chorale's title, after all, is "Wake up," not "Loosen up." I don't want to make too much of these faults; this is a very enjoyable CD. Because this is a budget-priced "Encore" release, the booklet notes are pretty superficial. It's the music that matters, though, and at this price, anyone can afford pleasure of hearing one of the past century's great trumpeters make glorious music. Don't wait for a wedding to hear how good the trumpet and the organ can be for each other!